Can I Play Dupla Sena Online? Read Reviews! Brazil’s Dupla Sena Lottery Exposed — Hurry Up to Double Your Chances! Getting your head around which lottery has the best odds can be really crazy. Different lotteries offer a bunch of different numbers, bonus balls, and tier structures. Brazil’s Dupla Sena takes it one step further. This bi-weekly lottery is actually two draws in on each day! It’s not going to climb to the size of some wins like US Powerball, but that’s part of its charm. Each Tuesday and Friday, two draws take place so players double their chances with the same lottery ticket lines. Players simply select six numbers out of fifty per lottery line. There is no bonus or extra ball. There is also the usual option of doing a ‘quick pick’ that randomly selects your numbers. Two separate draws take place with players winning if they match four, five or six (jackpot) numbers. Both draws use all fifty numbers, so theoretically you could win on both. If the jackpot is not won in either of the draws, it rolls over. This is a straight cash jackpot that pays out 46% of all money collected in ticket sales. This is broken down to a 30%/15%/10% share for the first draw and 20%/15%/20% for the second draw, for six/five/four numbers selected. Win the jackpot and you don’t get to take it all home. Dupla Sena’s wins are taxed at 13.8% as required by Brazilian federal tax laws. That’s for both nationals and internationals. 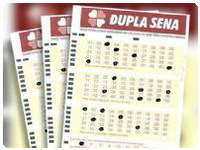 Dupla Sena is open to anyone who is over the age of 18 years and is not in violation in their own country for playing lotteries internationally. Who is Dupla Sena lottery? Dupla Sena is operated by the Caixa Company, which is a bank. With the success of Mega Sena – Brazil’s biggest jackpot game – they introduced this dual draw lottery in 2001. The actual percentage split on the winnings is supervised by the Ministry of Sports. Why you ask? 33% of all ticket sales go to government organizations primarily sports. Winners have 90 days to collect their prizes and any money unclaimed goes straight to the Fund for Student Financing of Higher Education. There are several options for contacting Brazil’s Dupla Sena, though keep in mind if you’re using the telephone, their main language is Portuguese. There is a snail mail address but no form to complete or email address. If you are playing through one of the great lottery service providers and have questions, I suggest you contact them. I’m not sure why you would have to as this is a very straight forward, officially run the lottery. Would you mind rating Dupla Sena? This is a mid-range jackpot lottery and it is important to remember when they advertise the jackpot amount – it’s in Brazil Real. The current exchange rate is about R$1 equals about the US $0.44. The lottery does grow with the rollovers with the largest to date of R$11 million (roughly US$5.37) in 2010. Brazil’s Dupla Sena gets a thumbs up. Your ticket lines actual count for twice the amount of draws other bi-weekly lotteries offer. Though there are only three prize tiers in each of the biweekly draws, your lottery tickets get a shot at the big jackpot twice each time. How Much Does It Cost to Play Dupla Sena Online? Okay, the whole concept of two draws taking place on the same day is attractive. The concept of only three prize tiers is not attractive. The 13.8% tax is also not attractive though at least they are up front about it. Nice little lottery but not going to get to those mega numbers like US Powerball.